There's also plenty of info on the Github README page which should be adequate for getting you started with it. Testem was built using node.js and along the way of building it I've encountered some very interesting techonology and have had to solve some very interesting problems. After that, I decided I wanted a rich UI and so required the full power of ncurses and rewrote it using Mscdex's node-ncurses. This is when I concieved of the tabbed interface, more or less like what I have now. When I got the UI working and looking the way I wanted, I encountered one more problem: flickering. When repainting the tabs, the UI would blank out the space it needs to paint to before painting the text(to get rid of old traces of text), and it refreshed all the tab headers everytime the test results for any browser changed, as a result, I was seeing some unwanted flickering. I decided I needed to use the MVC pattern, where when some state on a model changed (i.e. the test results for a paricular browser), I only have to update the view which represents that model (the tab for that browser). I could have written this on my own, but with all the talk about Backbone.js I was beginning to feel left out - like how everyone's talking about the new movie that you haven't seen and so you finally give in and go see it. The Backbone rewrite worked out very well, and is what I have stuck with now. Because unicode characters does not work by default on Windows, I fall back to ascii characters there. Although Windows support ANSI terminal codes for the most part, it does not certain features like text scrolling, which I had to work around. 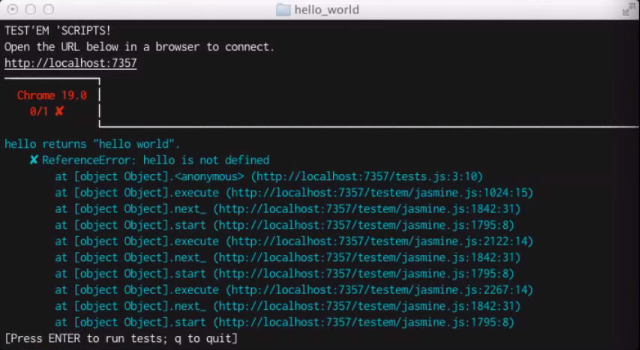 Testem uses Express and Socket.IO (stables for Node programs) for the HTTP server that serves up the necessary HTML, JS, CSS, and WebSocket goodness require to run the tests in the browser. The serve will basically serve any file in the current directory via HTTP. It sets Cache-Control to No-cache and ignores headers if-modified-since and if-none-match in order to avoid the browser caching anything. There are some existing file watcher libs out there but I wrote by own because most of them were still not using the fast fs.watch at the time that I looked. I am also using node-glob to allow specifying glob patterns in your testem.yml file. Unfortunately, I found out later that fs.watch is not reliable when using vim to edit the files in question, for that reason, I also use fs.watchFile in addition to fs.watch as a fallback. Getting the browser launcher to work for various browsers on various platform was just a tedious process of installing and testing. For some browsers I had to use extra tricks like telling it to create a new user profile directory and then deleting that directory after it's done. To test code on IE7 and IE8, I would use IE9's compatibility mode, but rather than using a <meta> tag, I used the X-UA-Compatible header, which means I can use the same HTML markup. I found Caolan's async library to be great for doing mapping and filtering for arrays in an async manner, it dramatically simplified my code browser launcher code. Getting feedback from other folks using Testem in the real world, and then improve the user experience as much as possible. BrowserStack integration - after seeing Bunyip I was like oh snap! I need to get on this.